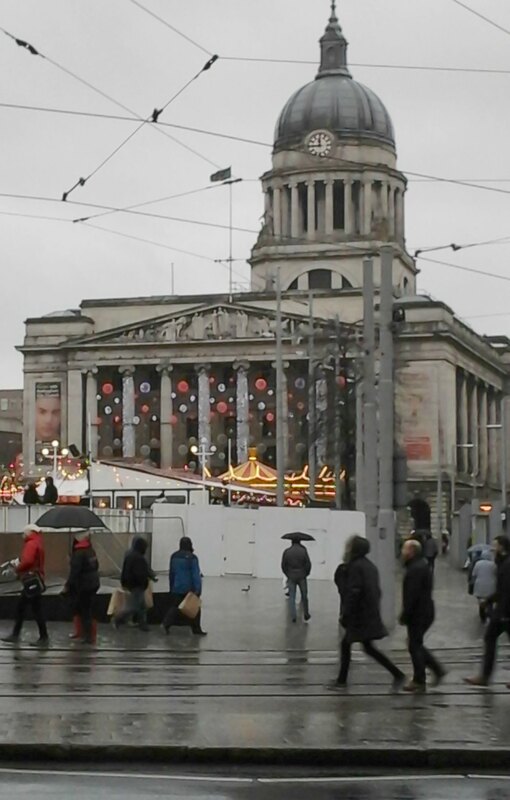 Christmassy Nottingham In The Rain! On Saturday I went into Nottingham with my elder daughter, Nicola, and grandson Kieran, to do some Christmas shopping. We went on the train – just to keep my train-mad grandson happy – and were out all day, not getting home until the evening. As you can see from the photo above, it poured down for most of the day, so we did spend more time than we’d have liked mooching around inside the shops. Nottingham is a big city with a history that goes back hundreds of years. It is known worldwide mostly for its connections with the Robin Hood stories, but there’s a lot more to Nottingham than that, and I’ll probably do a post about it sometime next year. 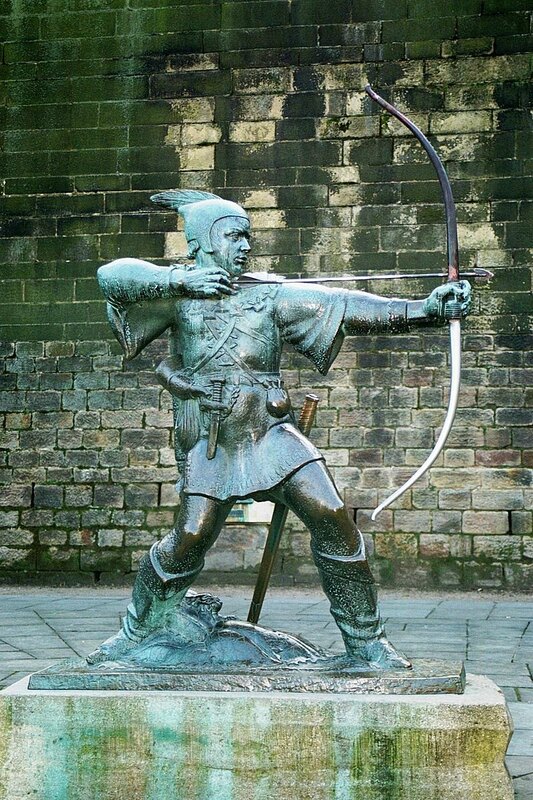 Robin Hood Memorial in Nottingham, near to the castle. Uploaded by Soerfm under GNU Free Documentation License. Wikimedia Commons. In the days before the City of Nottingham existed as such, the area which is now the Market Square was the centre-point between two Anglo Saxon towns in the old kingdom of Mercia. One of these towns was Snotengaham (also called Snothryngham, Snottingaham and – the usual name around here – just Snottingham). Whichever name is used, it simply means ‘the settlement of Snot’s people’ – to most people’s amusement. So the central area between these two settlements has been the centre of the city’s growth for hundreds of years. In summer for several years now, a large area of the square has been converted into an artificial, sandy beach for parents to take their children to play on, with a huge paddling pool in the middle – an excellent idea for a ‘Midlands’ city, a long way from the coast. The square was also the original site for Nottingham’s famous Goose Fair, which originated over 700 years ago and is held every October. In 1928, the fair was moved for redevelopment of the square and is now held on the Forest Recreation Ground, an open space about a mile north of the city centre. 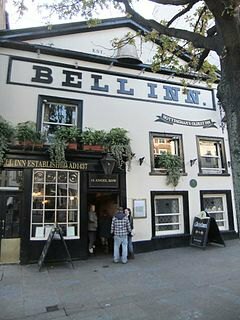 But the building that dominates the square, although undoubtedly impressive, is nowhere near as old as the Bell Inn. This is the Nottingham Council House building as seen on my ‘header’ image and this one below. It was built to replace two much older buildings that had been used for this purpose over the years – the old Norman ‘Moot Hall’ and the English Guildhall, last used in 1877. This new Council House was designed by Nottinghamshire architect T. Cecil Howitt and a building called ‘The Exchange’ was demolished in 1926 to accommodate it. In 1929, thousands of people gathered to watch its official opening in by the Prince of Wales, who later became King Edward VIII, open the great doors with a golden key, which is still displayed on a wall plaque, just inside the building to the left of the grand staircase. 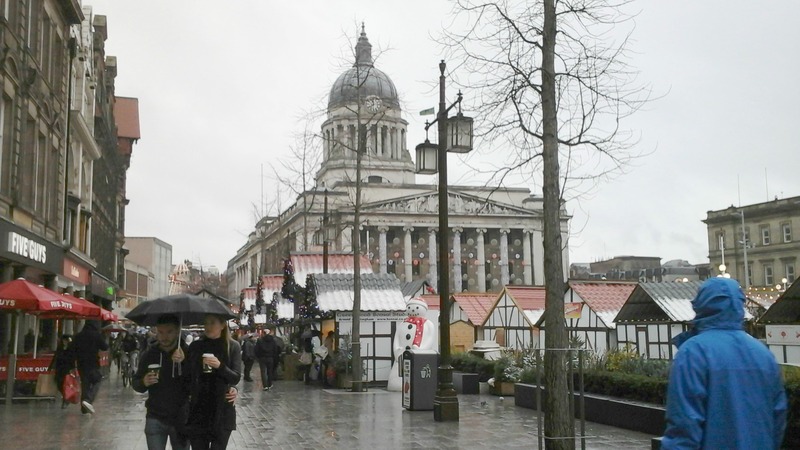 Unlike the Lincoln Christmas Market, held only over a long weekend, Nottingham’s is held throughout December. Like several others in the U.K. nowadays, it is also fashioned after the German markets, although Lincoln was the first in the country to do so. Still, it all looked very pretty, with a little fun fair and lit-up stalls – despite the rain. Lincoln Christmas Market, however, has the great advantage of its wonderful setting in the castle bailey and being overlooked by the beautiful, towering medieval cathedral. It draws people back, year after year. May I use the twelfth one to illustrate a post? Nor mine ! Thank you, Millie ! What perfect timing for me, as I have recently started watching one of the Robin Hood TV series and was starting to wonder about Nottingham! The Christmas market looks warm and welcoming even in the rain. And I love that there is a “mushy peas” stall! Thanks Joy. Yes, Nottingham and Robin Hood really go together. I forgot to say on my post that the Market Square was where the archery contest was held (as shown in the Disney film). It would have looked very different in the Middle Ages! If you’re watching the 2006 series, just called Robin Hood, with Jonas Armstrong as Robin, it’s nowhere near as good, or authentic, as the 1984 version, ‘Robin of Sherwood’, with Michael Pride as Robin. This older version may look a little dated now, but it brings out the full feel of the period, with the lingering mysticisms and beliefs in the Old (pagan) Ways, incuding belief in Herne the Hunter. In the 2006 series the castles are patently not English and resemble those in Germany or other mainland European countries with the pointed turrets. The 2006 series is entertaining, though, in its own way. Gorgeous Gisborne indeed! Yes, I do feel a little better. “North & South” is where I first saw him — it’s one of my favorite period pieces ever. I own it and have seen it many times. To be fair, I like North & South for many reasons. Richard Armitage is just icing on the cake. 😉 And yes of COURSE he makes the most handsome dwarf! Funny that you mention that, because one of the reasons I went back to watch North & South yet again is that I’m looking for a “face” for each of the main characters in my novel. This is a technique a friend recommended, to imagine someone you know or an actor playing the part, so you can better picture the gestures, facial expressions, etc. And I’m thinking of Richard Armitage/Thornton as the “face” for my heroine’s oldest friend / unrequited love interest. Christmas is getting closer by the minute, and children are getting more and more excited. It’s so magical when they are little! Have a wonderful, family Christmas, Shivangi. Wow what an exciting post! I love these pictures and having a look around! Sounds like a wet day for all of you! wonderful post! This is so fascinating, and very beautiful. We don’t have the quaint aura here, its very magical. I lived in Germany for a while a number of years ago, and there was never a more beautiful Christmas than that one, really magical. The beautiful buildings and snow and lights and quaint little villages, I really love it over there. Oh, I long to go to Germany for Christmas, so you are now making me green with envy. We had hoped to go on a tour of the Chrismas markets this year, but other, family things turned up and we had to give it a miss. Next year, we’ll make every effort to get there. I imagine it all to be as beautiful as you say, and there is so much more chance of snow than there is here, apart from Scotland. How lovely that you lived there at one time. You must have a lot of wonderful memories of that time. Thank you so much for sharing this. I do, I lived in Bitburg and Trier. Trier is unbelievable. They have both progressed (probably a Mc Donalds on the corner) but still incredible, I adore the olde countries. It’s like a wonderland. I can imagine. Those places always remind me of something from the Hans Christian Anderson stories – traditional dress and all. We may get out there one day. Someone else on WP recommended Heidelberg, but I think that’s quite a large city. I love the little towns and villages. Thank you again for sharing your wonderful experiences, Holly. Don’t forget to go to Munich if you get the chance. Heidleberg and Dresden are fabulous. If you are looking for a magical place stuck in time it is Luxembourg. Georgeous and very small country. No bigger than a small city. You know, Holly, with your travel experience, I think you ought to write Travel books! 😀 You are so well travelled and are travelling still, with your job, I believe. Thank you so much for the info. on places in Germany. I’ve never considered Luxembourg, but it’s somewhere else to think about. I prefer to go there than write about it, lol. It is a thought though, thank you Millie. I know! I paid for them. 😀 But, to be fair, I offered because it was a cold wind and pouring down, and the denim would never have dried. I haven’t been there, but it looks really lovely, especially with all Christmas decorations! That’s a great tram picture. 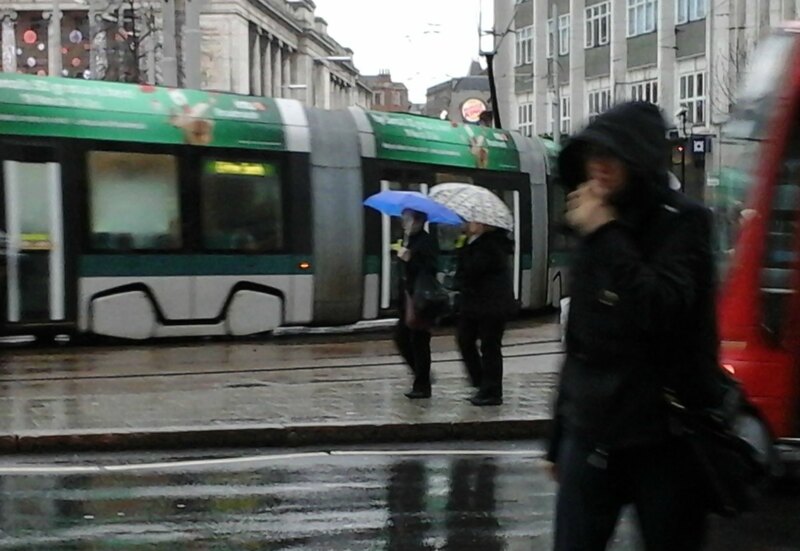 The people walking in front (especially the slightly blurred person and the blurred bus) give it a sense of “action” I reckon, rather than just “here’s a picture of a tram”. Out of all the places that I’ve lived, that’s my favourite! Thank you, Andy. I’ve really enjoyed talking to you since we ‘met’ on WP and I hope you have a wonderful family Christmas, too. We’ll be invaded by our tribe, as always, and I’ll spend my time cooking, as I’ve done for the last 45 years! But I’ll be ecstatically happy to do so. As for city living… it obviously has its pros, but to me those pros are only required every so often. I don’t go out buying furniture that ofetn, for example. 😀 I like a quick visit into cities to see the historical sites, or even shopping (yuk!) but then I like to go home to the countryside. St. Just sounds perfect, and I’ll be sure to have a look when we get down there – hopefully next summer. Your right about cities having their occasional uses, museums, large bookshops and historical sites being all I can think of – the shops are one of the disadvantages to cities!!! LOL!!! LOL!!!! After a few glasses of your favourite tipples I’m sure the conversation would get really good, albeit a little silly 🙂 Lol! I haven’t seen any missed comments or pingbacks, Susan, but I’l check my junk file just in case it landed in there. I’m beginning to think some little gremlin is sabotaging my pingbacks! 🙂 I’ll check out your post as soon as I can. Thank you for accepting! Great pictures Millie! Looks like a lovely Christmas market, despite the rain!! If you ever want to visit the Swiss Xmas markets, I would be more than happy to show you around!! I went last weekend and it was fabulous! So pretty, with weird and wonderful goodies on show! It sounds as though you’re heading for a great Christmas over there! I imagine you’ll be having fun with family and friends. Nottingham looks like a place of bygone era. Beautiful photos!! That is what is wonderful about Christmas…you can create any tradition even without having the imagination. Just go out and there is something you can repeat and enjoy again and again. Well enjoy your Christmas season with your family and friends! Have a wonderful Christmas, too! Yes, any celebration repeated often enough will become a tradition. I like nothing better than to keep them going. Very interesting post, Millie, and pictures are great! I read and enjoyed! You are doing well, honestly! He is excellent and very affordable. He’ll be doing my 3rd book, too. Robin Hood topiary was astonishingly created with grass and flowers and he was holding his arrow too.I didn’t know much of the historical details you shared with us and it would be interesting if you could write a post on the long history of this lovely city.Your gallery is fantastic and it perfectly displays the festive atmosphere.How lovely it’s held throughout December;it gives so much life to the city and to the shops.Thank you dear Millie for this wonderful tour around the city. I have just read this post and all the wonderful comments all your followers have posted. It is quite a conversation. I think I mentioned that I did a Xmas markets tour of Europe a few years back. No snow that year, but lots of fun visiting all the stalls in the various cities. I think my favourite was at a little town called Osnabruck in Germany near the Belgian border, and also the ones in Munich and Innsbruck was very good. As for Nottingham: I am intrigued, of course, because of the Robin Hood myth. I see it is just like a big city except it has wonderful pubs like the Bell Inn. How awesome!! It must have been renovated many times as it doesn’t even look very old. I envy you the old architecture that is found in all your villages. I read your comments about village versus city life and wonder, do it worry you that you don’t have access to medical and ancillary services in a small village, or maybe you do? As I get older I like the peace and quiet of small town life better, preferably not too far from the water, but do not want to move to somewhere bereft of services. I suppose everything in England is reasonably close, in comparison to Australia? Yes, it has been quite a conversation, and I’m overjoyed by all the nice things people have had to say, and the extra information about Christmas markets. As you know, I’m dying to get to the ones in Germany and was really disappointed not to be able to do that this year. And your lovely comment is just the icing on the cake. I have a lot of different Christmas markets to consider now. Ideally, we’d love to do a tour that visits some of the best ones. The tours we’ve seen usually start in Belgium and visit a couple there before heading into Germany. I agree with your worries about living in an isolated village as you get older. It’s not a good idea. Our village has no amenities whatsoever, other than a church, but it’s only a mile and a half from a large village which has everything except big departmental stores..There is a medical centre, dentist, library, three pubs/restaurants, playing fields/ sports fields and a priimary school and day nursery. So we’re not that cut off. Admittedly, we usually drive down there when we want shopping, but I often walk if I haven’t got much to carry. I imagine in a country a big as Australia, some settlements could be completely isolated from others. We have some like that in the hills – and, of course the Scottish Highlands or Central Wales. I can’t tell from the photograph, does Robin have any string in his bow? The answer to that, BunKaryudo, is yes…and no! Yes because he should have one, and no because souvenir hunters keep pinching it! They also used to take his arrow in the past (the sculpture has been there since 1952) and on occasion, part of his bow has been broken off! Now both arrow and bow are made of some king of metal which can’t be broken too easily. Unfortunately, the string is more often than not absent. I’ve never seen it there, but there are a few photos around on which it is. Miss Millie the pics are adorable… Hoping to Visit Nottingham sumday!! Thank you, Pinky! There’s a lot to Nottingham that I haven’t yet posted about, and so much history to talk about. I’ll be doing more in the new year. It would be wonderful if you could visit Nottingham one day – just as I long to visit your country! I’m sure it must be 2016 for you now (or almost) so I hope your coming year is wonderful for you. Thank you so much for connecting with me.